Update – This post from the site ‘the verge’ has posed the inquiry, why has windows 8, made for that new smart phone marketplace, not taken off. Many of the bigger companies haven’t embraced the latest Operating system like they were projected to, and now many weeks later we are still waiting for that first notable pc tablet using the windows 8 Operating system. The Windows 8 operating system debuted on October 26th, six months ago today. Intended as the savior of a flagging PC industry, Microsoft’s latest software is designed specifically for touch-equipped hardware. While Apple continues to increase its iPad shipments year-on-year, Microsoft and its OEMs are fresh out the gate with an operating system that tries to marry a keyboard and mouse-driven UI to a modern touch-enabled interface. Microsoft provided some early signs of Windows 8’s sales performance, but recently it has been rather quiet. How well is the big Windows 8 gamble paying off? The first indication of Windows 8 growth came from Microsoft itself. The software maker announced 40 million license sales in late November, noting that Windows 8 was outpacing Windows 7 for upgrades at the time. Shortly afterwards, in January, 60 million license sales were announced, the same amount as Windows 7 at practically the same stage in its early lifecycle. However, at the current point in the Windows 8 rollout, Redmond has not yet disclosed the latest figures. Microsoft’s Q3 earnings have come and gone, and Windows revenue was flat despite a reported downturn in PC sales. At the same time in Windows 7’s history three years ago, Microsoft was declaring it “by far the fastest-selling operating system in history” with over 10 percent of all PCs running Windows 7. The company also announced 100 million license sales of Windows 7 on April 27th, 2010. The radio silence from Redmond isn’t a good sign this time around, and confusing figures from market research firms aren’t helping. IDC estimates that PC sales are down 13.9 percent from the same quarter last year, and Gartner says they’re down 11.2 percent. However, IDC’s figures do not include Windows-based tablets and some hybrids. IDC revealed to The Verge that “all slate-form factor devices with detachable keyboards, regardless of name, manufacturer, OS, or chip type, are considered tablets and not PCs.” As a result, the company tracks tablet shipments separately. Gartner says it tracks Windows 8 tablets and hybrids as “ultraportable PCs,” but the firm does not track Windows RT devices. The difference between the two data points suggests that Windows-based tablets only account for just over two percent of PC shipments. IDC was quick to blame Windows 8 for the PC decline, despite it not tracking the new devices OEMs are trying to push. “The Windows 8 launch not only failed to provide a positive boost to the PC market, but appears to have slowed the market,” said Bob O’Donnell, an IDC vice president. IDC analyst Jay Chou says “The reaction to Windows 8 is real,” and it would appear that not every Windows 8 change has been popular. A controversial decision to scrap the Start button and Start menu in Windows 8 has divided opinion. Microsoft is listening to that feedback and considering how it will implement a boot-to-desktop option to avoid the “Metro” interface and a revival of the Start button. Both of these options might help with the perception around Windows 8, but they’ll do little to get devices into the hands of users. 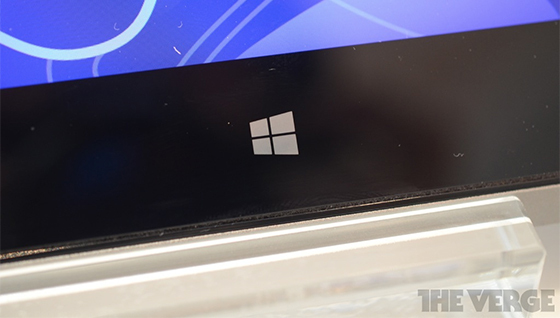 Strategy Analytics, another research firm, revealed this week that Windows-branded tablet shipments in the recent quarter (January to March) have jumped to 7.5 percent from 0 percent in the same quarter last year. Although that sounds like a steep rise, Strategy Analytics’ director of tablets Peter King explaines that it’s not a big number in absolute terms. “Microsoft and its partners have got off to a bad start,” he says. “There’s no doubt about that.” King says Microsoft’s secretive development process led to a lack of awareness around Windows 8. Coupled with a lack of retail presence for the new touch-based devices, things are slow. Unlike IDC and Gartner, Strategy Analytics exclusively tracks slates and tablets with detachable keyboards. King stressed that Microsoft and its OEMs are mainly selling tablets direct to businesses, rather than retail and consumer channels. But thanks to other divisions at the company, it would appear that not all was lost. “Revenue from Surface and increased commercial sales of Windows was offset by the impact on revenue of a decline in the x86 PC market,” says Microsoft. It’s clearly part of the strategy for Surface, and a key reason Microsoft placed this product in the Windows division. The PC market and Windows are struggling, but Microsoft is betting on a long game with increased Surface distribution and low-cost touch-based Windows devices. Even with Microsoft’s own Windows 8 license figures, and market research estimates, it’s worth noting that these calculations are based on shipments. They do not reflect how many consumers have purchased these devices. Until Microsoft, or other researchers, provide a solid breakdown of sales, nobody outside of Redmond really knows exactly how Windows 8 is doing. For now, it looks like slow progress in a huge, risky bet that Microsoft is willing to stick at for a long time. With the Blue wave of updates on the horizon, it’s time for the software maker to provide clear data on Windows 8’s progress to see exactly where things stand. Microsoft’s big bet depends on Windows 8 and the industry wants to understand it right now, not only when Microsoft is ready to share good news.